The fantastic cover of Blackout gives some hint of the creeping darkness in this third instalment of the Dark Iceland series - I bought an ebook but I think it would have looked even better 'in the flesh'. As an ash cloud threatens to turn the country into darkness, a brutal murder is committed in Iceland. I used to want to visit Iceland, but I'm having second thoughts after all the murders portrayed in Ragnar Jónasson's books; they are so very realistic that you forget they are fiction. I even think of Ari Thór as an old friend, one who's annoying at times but he is a cool iceman after all. I felt like there were a lot of characters in Blackout, and being set before book 2, Nightblind, it didn't take much to confuse me. As much as I didn't know who was who at times, it didn't stop me enjoying the story but I do wish that I had read Blackout before Nightblind. As I've come to expect with Ragnar's books, the elements are painted as characters in their own right and there was nothing more menacing than an ash cloud from a volcanic eruption. I particularly loved the new character of Isrún, a young journalist, who is determined to get her story before the darkness descends. We dig a little into Isrún's family history which was my favourite part of the story, being almost a dual storyline and the thread which kept me turning page after page. The whole Dark Iceland series is set to be a classic series for crime fiction lovers. 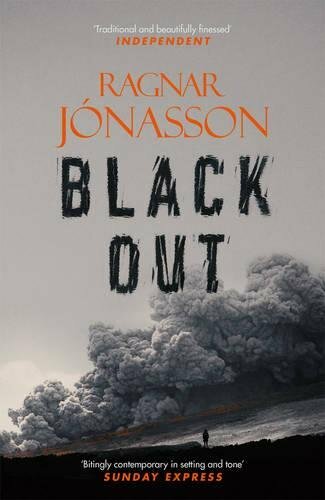 You don't get much darker than Icelandic Noir and Blackout will have you turning the pages until all its dark and chilling secrets are revealed.